The museum will be closed this Friday, Saturday, and Sunday – April 19 and 20 for the KHAY Fest and Easter Sunday. In remembrance of D-Day, June 6, 1944, the Southern California Wing of CAF will celebrate the 75th anniversary of one of the most pivotal events in military history. Join us on Saturday June 8, 2019 from 11 a.m. to 2pm. Man’o War will represent both the aerial armada that supported the Normandy landings and the impressive CAF SoCal fleet. Join us for another instalment in the Living History Presentation series. Hear from our historians, maintenance personnel and pilots about the YAK3 fighter and take your chance to get a closeup view of the cockpit. We are pleased to once again participate in the California Capital Airshow, on this the 100th Anniversary of Mather Airport. With a spectacular fireworks display and the USAF Thunderbirds performing, the show promises to surpass its own high standards achieved over the years. CAF SoCal warbirds, the AT-6 SNJ “290”, P51 D “ManO’War” and B25/PBJ “SemperFi” will be on display at the airshow. Visitors can tour the interior of the PBJ bomber, talk with our crew and book rides on the SNJ and the P51 on show days. As always, flight slots are limited and we encourage those interested to book their flights for the show ahead of time. The US Navy Blue Angels may think they’re the featured event at the Minden-Tahoe Airshow in October, but our fans (including our beloved Blue Angels) would agree that the Hellcat and Bearcat tribute to the Blue Angels will be the real highlight of the show! Additionaly, our P51D Mustang ManO’War will be present for static display. 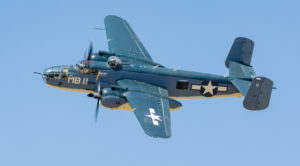 Those wishing to enhance their airshow experience and get a personal connection to these venerable WWII era warbirds can do so with a flight aboard ManO’War. If you missed us at the Truckee/Tahoe Airshow, here’s your final opportunity in 2018 to soar over the Sierras aboard the thoroughbred Mustang. Flight times are limited and pre-booking your flight is highly encouraged. The Southern California Wing of the Commemorative Air Force invite you to leave a Legacy by purchasing a Commemorative Brick. The bricks will be installed at our entrance by the flag pole leading into the aircraft museum. The bricks are 4”x8” and made out of red clay with black lettering to include up to 3 lines with up to 18 characters per line. To place your order, download and print out this form. Return your completed form with payment attached to the museum or mail in to the address indicated. Or, place your order online directly with the brick engraver by following the LINK HERE. More information soon. Stay tuned!! Our PBJ, the Marine Corps version of the venerable B-25, is the only flying example in the world today. On Saturday, September 1st, CAF SoCal is hosting an event focused on the PBJ and Marine Bombing Squadron-611 (VMB-611). A trio of CAF SoCal guest speakers will walk you through the history of the PBJ and VMB-611, a 23-year long restoration, and the celebration of the Doolittle Raid’s 75th anniversary. So mark your calendars to learn about this historic aircraft, its historic return to flight, and its participation in the historic Doolittle 75th anniversary. “Avoid combat at lower altitude with Yak fighters lacking an oil cooler intake beneath the nose!” That directive from Luftwaffe leadership said it all – its fighters were no match for Russia’s newest fighter, the small but lethal Yak-3. On Saturday, July 22nd at 11AM, CAF SoCal is hosting an event focused on this late addition to the air war over the Eastern Front. Introduced in the summer of 1944, the Yak-3 was just in time to have a significant role in Operation BAGRATION, the Soviet strategic offensive fought between June 22nd and August 19th. This operation was a decisive Soviet victory that completely destroyed German Army Group Centre. The guest speaker is CAF SoCal’s own Steve Barber, Wing leader and Yak-3 pilot. So mark your calendars to learn about the dominant fighter on the Eastern Front, the Yak-3. Saturday July 22nd, 11am at the Commemorative Air Force museum at the Camarillo Airport.